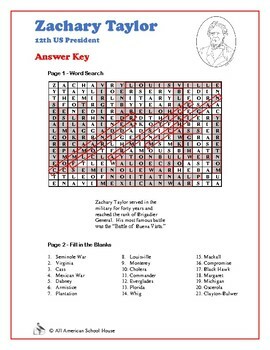 This two-page Word Search and Fill in the Blanks activity sheet is about the 12th President of the United States, Zachary Taylor. 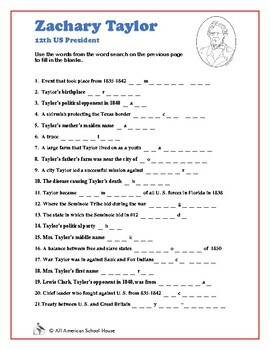 This series of Word Searches has an added dimension - after the words on the list have been crossed out, the remaining letters are also used. Going from left to right and top to bottom, the letters that haven't been crossed out after completing the word search are to be placed on the spaces provided at the bottom of the page. When all of the letters have been placed in their proper space, the letters will spell out some facts about the titled subject! 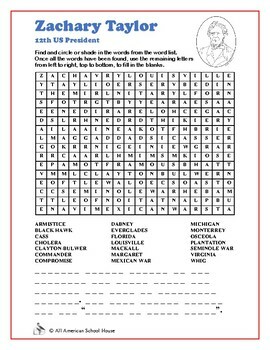 The second page is a fill in the blanks worksheet that lets the students know how each word in the word search relates to the subject. Great printable activity for early finishers or substitute folder!